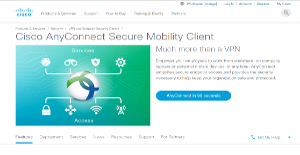 Cisco AnyConnect is an eternally-on protection for company employees regardless of the kind of connection they have. The application enables them to work without hindrances wherever they are on secured networks. With Cisco AnyConnect, companies also gain a deeper understanding of their users’ and endpoints’ behaviors. This allows them to protect their networks much more rigorously and effectively in case of threats. Moreover, Cisco AnyConnect affords premium protection to its users no matter where they are. This way, non-compliant or unregistered devices cannot gain access to the enterprise network. Therefore, companies can rest assured that only those devices with their approval can access sensitive company information. With Cisco AnyConnect, all devices a company provides its employees are covered. Be they Mac, Windows, Linux, Android, or even iOS, they can rest assured that business information on any desktop or handheld machine is secured and protected. Cisco AnyConnect affords all-around access to employees to their company’s network. This enables them to do their job with a peace of mind no matter which device they are on and regardless of the time or location. This also heightens their productivity since they can deploy or perform their tasks with ease even outside of their business premises. With Cisco AnyConnect, a company’s IT team can gain better visibility and in-depth understanding of both user and endpoint behavior. This enables them to vigorously protect the entire system and also find ways to develop their network operations. Viruses, malware, and other byte-sized threats are nothing against Cisco AnyConnect. That is because the enterprise VPN puts up hardy walls against such threats to ensure that only compliant devices have access to the company network. On top of that, the application can be coupled with another Cisco program to extend protection even to devices with their VPNs turned off. Having a plethora of devices to manage can be a chore for IT teams but Cisco AnyConnect provides them with a single interface to do so. Not only does this offer a consistent user experience across the board, it also eases the burden on the IT staff. If you are considering Cisco AnyConnect it might also be a good idea to examine other subcategories of Best VPN Services gathered in our base of B2B software reviews. It is important to realize that almost no service in the VPN Services category is going to be an ideal solution able to fulfill all the needs of all business types, sizes and industries. It may be a good idea to read a few Cisco AnyConnect reviews first as specific solutions can excel just in a really narrow group of applications or be designed with a really specific industry in mind. Others might function with a goal of being simple and intuitive and as a result lack complex elements needed by more experienced users. You can also find apps that support a large group of users and give you a complex feature toolbox, however this usually comes at a more significant cost of such a software. Be certain that you're aware of your needs so that you pick a software that provides exactly the features you search for. How Much Does Cisco AnyConnect Cost? We realize that when you make a decision to buy VPN Services it’s important not only to see how experts evaluate it in their reviews, but also to find out if the real people and companies that buy it are actually satisfied with the product. That’s why we’ve created our behavior-based Customer Satisfaction Algorithm™ that gathers customer reviews, comments and Cisco AnyConnect reviews across a wide range of social media sites. The data is then presented in an easy to digest form showing how many people had positive and negative experience with Cisco AnyConnect. With that information at hand you should be equipped to make an informed buying decision that you won’t regret. What are Cisco AnyConnect pricing details? What integrations are available for Cisco AnyConnect? If you need more information about Cisco AnyConnect or you simply have a question let us know what you need and we’ll forward your request directly to the vendor.